Pink (H8) flowers darkening to heliotrope (H12), XII–IV, in long spikes and slightly scented; mid-green foliage, the young shoots tipped cream in spring; height 46–60cm; spread 61–75cm. 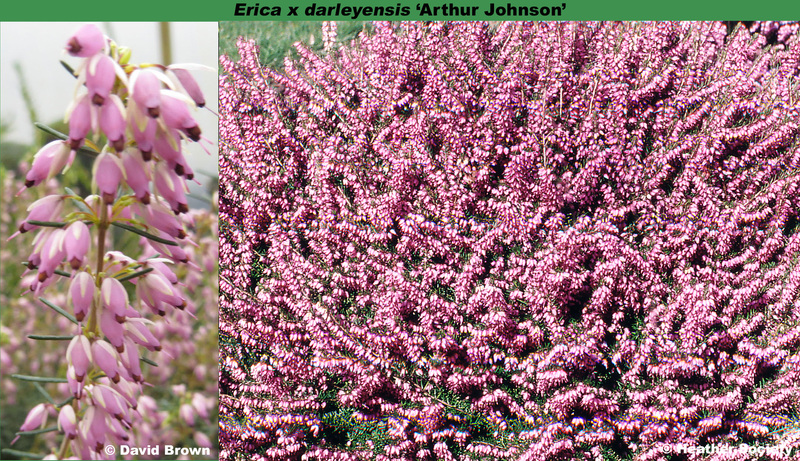 Chance seedling; found by A. T. Johnson in his garden at Conway, north Wales, before 1952; it is thought to be a seedling between Erica erigena 'Hibernica' and Erica carnea 'Ruby Glow'. Named after the finder, Arthur Tysilo Johnson, a one-time schoolmaster and later a renowned gardener.